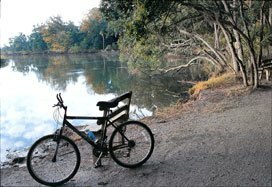 One of the best things about Edisto is that it is so small its possible to ride a bike all over the beach and island. A bike path winds its way through most of the town of Edisto Beach. It takes riders past shopping, restaurants, and scenic views worth every pedal. The bike path on Edisto Beach is clearly marked and takes riders on all of Jungle Road and portions of many side streets. Bicyclists are able to ride on the sidewalks and streets as well, as long as they follow the rules set forth by the towns ordinances. Its a good rule of thumb for cyclists on the road to not ride more than two side by side. If riding on the roads, cyclists should keep to the right side of the roadway when possible. This allows for vehicles to pass the cyclists safely. In addition, while riding on roads, its a good idea for cyclists to pretend that they are a vehicle and obey all rules they would follow if they were driving. This means stopping at stop signs, signaling when turning, and being aware of their surroundings. All cyclists need to make sure that they arent holding on to anything that makes it impossible for them to keep at least one hand on the handlebars. Wearing a helmet is encouraged, but not mandatory. One thing that is mandatory, however, is the use of reflectors and a light emitting a white light visible from a distance of 500 feet on the front of a bike and a red reflector visible from 50 to 300 feet at the rear for anyone who wants to ride a bike at night. Several companies in the area rent bikes, so if you make it down to the island without bringing your own, theres always a beach cruiser out there waiting to be ridden all over the island.